If you require any information, please contact us using the form below, by accessing our social networks Facebook and Twitter, by phone, WhatsApp and/or E.mail. 33449 Luanco, Gozón. Asturias. España. In according with the provisions of art.5 of the Organic Law 15/1999, we inform you that the information requested on this form are necessary to answer to the query/request we submitted and will be part of the files held Pradina Ménendez García as head of the Pradina files RURAL PROPERTIES, for internal use, and administrative management resulting from the supply of services that is performed within the profile understand that indicate. *More information Legal Notice and Data Protection. In compliance with article 10 of Law 34/2002, of July 11 , Services Information Society and Electronic Commerce, below the identifying details of the Company : Name : García Menéndez Pradina. Spanish NIF/CIF: 11364289N Address : C/ Valeriano Fernández Viña , 3-5º E. 33440, Gozón (Asturias – SPAIN) Spanish Phone : +34 619 365 271. The source code, graphic, design, images, photographs, sounds, animations, software, texts, as well as the information ans contents included in this website are protected by the Spanish laws on intellectual property rights and industrial of Pradina Menéndez García may not be reproduced and / or publication of all or part of the site, nor may they be handled, distributed, divulged, modified, transformed or divided or other legally recognized rights of the owner, without the prior written permission of same., Pradina Menéndez García. Users may solely and exclusively use the material which appears on this website for your personal and private use, is forbidden commercial use or for illegal activities. All rights under copyright are expressly reserved by Pradina García Menéndez, who will ensure compliance with the above conditions for the correct use of the contents presented in its website, taking pertinent civil or criminal apply in the case of infringement or violation of these rights by the user. Part of compliance with the current legislation included in Organic Law 15/1999, of December 13, Protection of Personal Data (LOPD), whose purpose is to guarantee and protect, with regard to the processing of personal data, the freedom and fundamental rights of physical persons, and especially their honor ans personal privacy. Pradina Menéndez García informs users that it has taken technical and organizational measures as provided in the regulations. 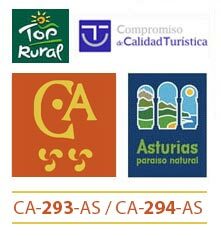 The personal data that can be collected on the page of the website of RURAL ACCOMMODATION – www.casaspradina.com – not be processed automatically unless commisioning any contact with the user, and under the previous authorization. 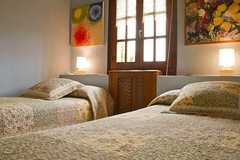 The holder – www.casaspradina.com – has adopted adequate security levels to adress the data provided. The user may at any time exercise their rights under the law, access, rectification, cancellation, and opposition. The exercise of these rights may be the user responding to the e-mails you receive. Pradina Ménendez García can modify, without prior notice, the information contained in its website, as well as its setting and presentation. Pradina Menéndez García committed trough this means not to make misleading. To this end , therefore, not be considered as advertising the formal or numeric errors which may be found troughout the content of the various sections of the website Pradina Menéndez García, produced as a result of maintenance and / or update incomplete or defective of the information contained in these sections. Pradina Menéndez García, as a result of the provisions of this paragraph, undertakes to correct as soon as it becomes aware of such errors. Pradina Ménendez García undertakes NOT TO SEND ADVERTISING CORRESPONDANCE WITHOUT IDENTIFYING IT AS SUCH, in accordance with the provisions of Law 34/2002 of Services of the information Society and Electronic Commerce. For this purpose it not will be considered the information sent to THE CLIENTS of Pradina Menendez García provided its object is to maintain the existing contractual relationship between client and Pradina Menéndez García, and the performance of the tasks of information, training and other activities of the service which the client has contracted from the company. Pradina Ménendez García THERE IS NOT RESPONSIBLE for the breach of any rule that may be incurred by the user´s access to the website, this website, and /or use of the information contained therein. Pradina Ménendez García, not be liable for any damage caused or likely to occur, whatever its nature, arising from the use of information and material contained on this website and the programs included. The links and hypertext, which, trough the website, this, website, allow the user to access features and services offered by third parties not owned or under the control of Pradina Menéndez García, the Company is not responsible for the information contained in these or for any effect wich may derive from this information. Pradina Menendez García, is not resposible for illegitimate use that third parties may make of the brand names, products names, trademarks not owned by that entity appearing on this website. Also, is not responsible for the integrity, veracity and legality of the contents of links to websites wich can be accesed from thisd website. The user is definitely the only responsible for the use made of the services, contents, links and hypertext included in this website.